Various locations. Visit the website here for addresses. An invitation to participate in conference in Poland allowed me to spend a few days in London on my way there and to explore what Polish kitchens had to offer. Once in the UK, I opted to spend the precious few days until I flew to Warsaw spending time with my little niece, Ava, and eating. 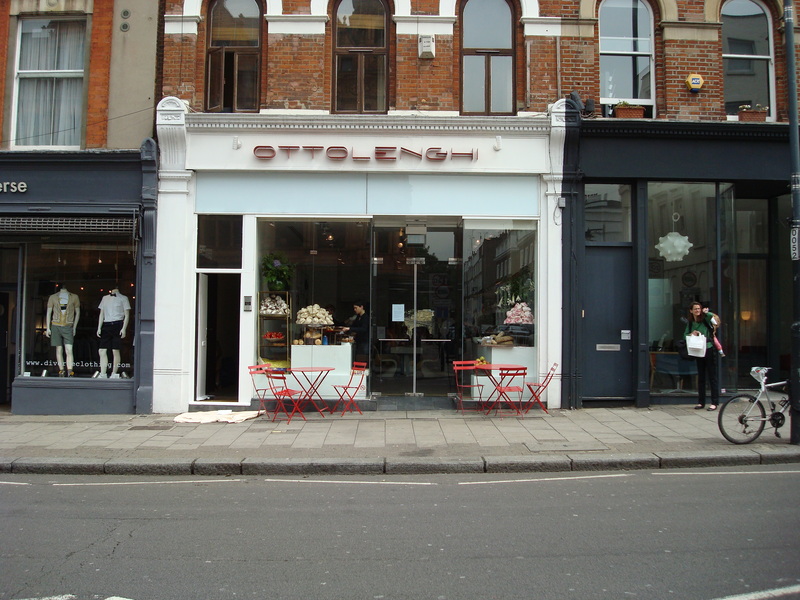 Ottolenghi’s chain of restaurants is one of my favorite places. The food — mainly salads, cooked vegetables, breads, and desserts — is mostly vegetarian. A decade or two ago, we would have called the white walls and counters, white tables, and Saarinen-ish white plastic chairs futuristic. Now it just looks like present-day urban chic. Platters of colorful salads on counters to the right and pedestals holding pasteries on the one to the left line your path to the tables toward the rear of the restaurant after you enter. You may eat your food in the white dining room or order it to go. And I know just how how much of the operating budget went towards the high-design Scandinavian high chairs they provide for kids. Ann’s got one in her kitchen. Simplicity characterizes everything they serve, from the hot mint tea that’s nothing more than fresh mint leaves steeped in hot water to the roasted vegetables. A regular rotation of salads keeps the menu interesting and ensures that someone like myself who visits only a few times a year never encounters the same menu. Roasted eggplant (aubergine) with semi-dried tomatoes, cumin, tumeric and chilli walnut yoghurt. Spicy char-grilled broccoli with chilli, garlic and toasted almond flakes. Roasted root vegetables and fennel with pea shoot, cress and orange, star anise dressing. Roasted zucchini (courgette), stuffed with feta, tomato, pistachio, raisins, basil and lemon. Roasted beetroot with red onion, feta, pecans, parsley and chilli yoghurt sauce. Roasted strip loin of beef with sweet coriander and mustard sauce. Char-grilled salmon with avocado, chilli, coriander and red onion salsa. Nothing fancy, but deliciously prepared. The cost is no more than most mid-range London restaurants. A selection of four salads will remove about $30 from your wallet. Two salads and a main course will cost about the same. Why can’t we in the US support chain restaurants that offer consistently good, healthy, and sustainably-produced food?